For her clients Marianne Strobl descended into the sewers, crawled into the caves of the Ötscher and - with her camera - she accompanied the construction of the gas plant Vienna-Leopoldau for years. She created multi-faceted portraits of the textile company E. Braun and the deluxe hotel Meißl & Schadn. Her proficiency in “flash photography” helped her to document new buildings such as the Semmeringvilla, furnished with historical pomp, a men’s home or a mental hospital in Trieste. 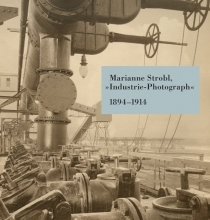 Strobl’s specialization in industrial photography was a practical strategy in order to subsist on the highly competitive market in Vienna around 1900. This self-assured photographer, who did not “hide” in the studio, like many of her professional colleagues, is to be rediscovered. Ulrike Matzer is an art and cultural scientist in Vienna, Austria.